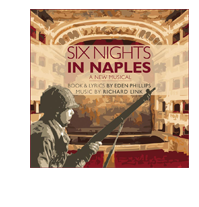 Six Nights in Naples is a new musical based on a quirky, true story set in the famous Naples opera house, the Teatro di San Carlo. In 1943, as British forces enter Naples, they find shelter at the teatro. There, with encouragement from a mysterious American visitor, they create and stage a show for Allied forces – in just six days and six nights. The soldiers are fortunate to find some interesting characters resident in the opera house, including an Italian diva, her dresser and her dancing daughter. Culture clashes between Brits and Italians, musical theatre and opera, the real world and the supernatural combine in a piece that affectionately sends up theatrical conventions – and throws in some on-off-on love affairs for good measure.